Here are five tips to help you save and start your year off on the right foot. 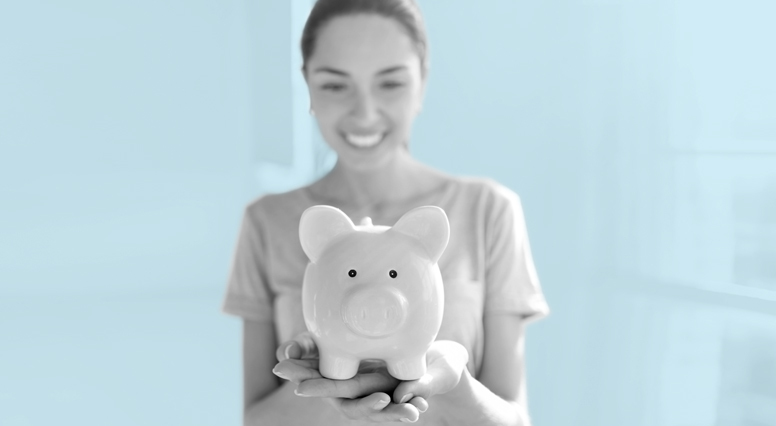 It is important to begin saving early in your working life and to make regular contributions in your RRSP, especially if you don’t have a pension fund or pension at work. Did you know that one-third of Canadian workers has a pension fund?1 For those who don’t have a pension fund, the Old Age Pension and a regular pension are not enough to guarantee financial security in retirement. For a 22-year old woman who is just out of university and entering the job market, does not have a pension fund at work and has an annual salary of $50,000, to ensure financial security in retirement, she will need the equivalent of 60% of a pre-retirement income2. Therefore, as soon as she begins working, she will need to save 11% of her salary to reach her retirement goals at age 65. If she waits until she is 30, she will need to save 14% of her salary. A good option for achieving your objectives is to opt for salary deductions. The advantage of salary deductions is that you will immediately benefit from tax rebates and will be able to make sure you are saving and contributing to your RRSP. Do you want to invest but want to know if you should invest in sectors that have performed well in the past rather than in trendy securities that promise incredible returns? Be mindful of the mirage of historic returns and flavours of the month. They can be impressive; however, it is rare that a given asset class, fund or sector has the same returns it yielded three, even five years earlier. It’s no secret that people want to get rich quick. But it is better to be cautious and to re-invest as needed to guarantee a financially secure retirement. Once you invest, it is important to determine your investor profile, diversify your portfolio and to know whether you’re able to anticipate market highs and lows. You have to know your limits, your investment horizons and your tolerance to risk. Consider your age, family situation and think about investing in foreign equities. No one can accurately anticipate market corrections and rebounds. Many people think that you need to be rich to invest in the stock market. False! There are financial instruments and investment funds that can help you invest. However, it is important to pay attention to mandatory fees, which can vary depending on the nature of the product and on the types of guarantees available. Others believe that you have to have the right contacts and good tips. That is also false! There are strict standards, controls and penalties to avoid this type of situation. These days, financial analysts and managers who are “in the know” get the information the same time you?nbsp;do. People also think that because rates rose last year, that they will drop this year. When dealing with the stock exchange or market, no one can predict the future. Returns can sometimes increase two years in a row. The advantage of investing in the stock exchange is that it moves with demographic growth, innovation and productivity. Shares tend to yield better long-term returns than bonds, even if they are a little more volatile. However, in the end, this undoubtedly guarantees you a better retirement. There is no doubt that you will live longer than you think. Longer life expectancies mean sometimes people spend more time retired than working. This is what’s called the concept of longevity risk, in other words, living longer than you think and burning through your retirement savings before you die. To address this longevity risk, push back your retirement two or three years if you can and if you want, and continue working, either part-time or full-time. Consider also buying a life annuity to manage your savings. The insurance company will pay you an annuity each month until you die. Thus, you won’t have to manage this longevity risk. Finally, opting to add segregated funds with stock market exposure to your portfolio may be a good option for you. Medium-term stock markets provide better returns than fixed-income securities. Having capital protection is also reassuring. However, it is important to consider the fees. But if we look at what’s happened on the market with the competition, these fees are similar and fairly competitive with mutual fund fees. The important thing is to identify, with a financial security advisor, what strategies are best suited to you for the new year. The advisor can help you prepare for your retirement and figure out how much you need to save each year. The advisor will be able to guide you, taking into consideration your reality and your needs. Still don’t have an financial advisor? Find an advisor near you today! Remember! The best investment is one that helps you sleep at night.